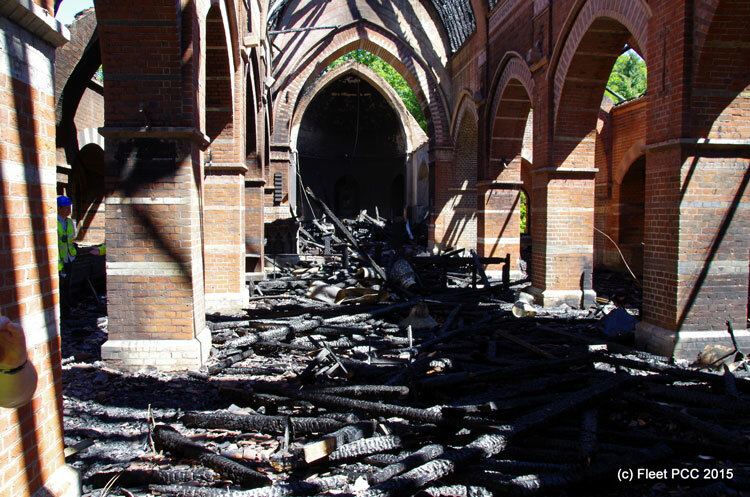 Following the devastating fire in All Saints Church in June 2015, we have been working with our insurers, architects, surveyors and most importantly the whole church and wider community to find a way to overcome our loss and build a Church that will once again be the place where our community meets at all stages of their lives. The Church insurance will cover a like for like rebuild but we know that this will not deliver the right Church building for the Fleet of now or the future. We plan to rebuild the Church and an annexe on the north side which will contain rooms available for community use. The Church and annexe will offer the whole community of Fleet a building worthy of this place for generations to come. Our insurers will contribute £3,000,000 which will reinstate the church on a like-for-like basis. An Annexe with its own access, providing essential new meeting room facilities for the whole community. It will include accessible toilets and basic kitchen facilities. Modern energy saving heating, new lighting system and full audio visual systems. Reinstate the original Burges design West Door opening into a welcome area. This would provide easy access for all. Shop at smile.amazon.co.uk, you’ll find the exact same prices, and selection as amazon.co.uk, with the added bonus that Amazon will donate a portion of the purchase price to the charity. Just click on the link to select “The Parochial Church Council Of The Ecclesiastical Parish Of All Saints Fleet” as your chosen charity. Make a donation – on line via our Virgin Money Giving Site. Do your online shopping via our easyfundraising site, every time you shop, you’ll raise a free donation for Fleet PCC, it’s that easy! By cheque made payable to Fleet PCC. (please mark on back of cheques ‘for All Saints building fund’) and send to our Parish Office – Fleet Parish Community Centre, Church Road, Fleet GU51 4NB – for the attention of our Treasurer. Financial gifts from individuals, community groups and companies. The Parish will be applying for grants. I’m already giving regularly. Will this be in addition to that? Yes! Your regular giving allows us to keep the doors open, cover staff salaries, maintenance of our buildings, and much more. How and when do I give? Can the Parish of Fleet claim gift aid? Yes – if you are a UK tax payer, then for every £1 you give we can reclaim an additional 25p from the UK government. You can use one of our gift aid envelopes or we can send you a form to complete. How can I get involved in fundraising activities? Please support existing events & activities in any way you can. Run your own event. Make suggestions to the fundraising team. Please consider the ways of giving carefully as they may not be appropriate for everyone, and consult your financial advisor before making any significant changes to your financial arrangements. All Saints was my Church all through my teenage years and young adulthood. I was confirmed there and later my husband Henry and I married there. It has a very special place in my heart and this is indeed very sad news. However, as has been mentioned earlier – the Church is really the people of God and they all remain intact. Hopefully this beautiful building can in time be rebuilt to its former glory. Thanks to all the wonderful and brave fire crews who limited the damage. I was devastated to see All Saints Church last night with flames coming out of the roof. I have lived in Fleet for over 50 years and have so many wonderful memories of special times in the Church. I took my Confirmation classes there with Rev. Deeds. Many of my friends were married in the Church. More recently I have enjoyed special services for All Saints School with my children, especially the leavers service at the end of year 6 and enjoyed my daughter playing her flute there with the All Saints School Orchestra. All my love and prayers are with everyone affected by this very sad loss and hope and pray that we can in time rebuild our Church. All Saints has been part of our lives for so many years. All of our family’s Christening, Weddings and Funerals have been conducted there. Sadly Mum’s funeral was last December, she had worshipped at All Saints all of her 96 years, as well as arranged so many flowers there. We as a family are so sad and pray for you all. Such a sad day – many generations of my family have been married, christened and had funerals at this beautiful and historic church. Our thoughts and prayers are with the community and congregation, we are so thankful that no-one was hurt. All Saints is a wonderful church and it will live on – our wedding there 5 years ago was such a beautiful day and although our daughters christening, which was due to happen at All Saints this weekend, will not take place there we know she will be welcomed into a strong and caring church family that will last forever. We were so sad to hear of the fire at All Saints as we were married there, our daughter was christened and married there and M’s father was a lay reader there. We have happy memories of the church and hope that it can be rebuilt. We currently live in New Hampshire USA but did live in Fleet before moving. We just wanted to say that we are really saddened by what has happened and are thinking of the community at this time. I am so sad to see thIs wonderful church ruined in a matter of hours. I’ve spent many happy times there from midnight mass, the reading of my banns, my wedding and then our Daughters christening. And my heart goes out to all those who were planning their weddings and christening a there in the coming weeks. I hope we can restore it to its former glory. Fleet will unite as they always do. On behalf of all at Hart Voices, we would like to celebrate the great many memories we made in this fantastic church. An historic landmark at the heart of the Fleet community for many years, All Saints is definitely Hart Voices’ “home”. We have rehearsed in the Parish Centre, every Wednesday evening, for many years (and hopefully will continue to) and have been lucky enough to have given a great many concerts in the outstanding acoustic of the church, accompanied by the magnificent organ. It is touching to read the glowing tributes of the Church and Parish, with the memories All Saints holds for the people of Fleet – it is a church (and for us, a concert venue) that is unmatched in the Fleet-area and will be greatly missed. On this terribly sad day for the Parish, for your faithful congregation and for Fleet as a wider community, we hope and pray that the church can be rebuilt and will assist in whatever way we can. And we look forward to a time when we can bring our music back to All Saints. To our dear friends in Fleet . . . . We are absolutely devastated to hear of and see the pictures of destruction at All Saints. Our thoughts and prayers are with you all at this challenging time. How very appropriate is your verse of the day from Isaiah on the Parish website: “but those who hope in the LORD will renew their strength. They will soar on wings like eagles; they will run and not grow weary, they will walk and not be faint.” You are a sturdy lot of dedicated, faithful and determined folk – our memories are of so many happy occasions in the Church – All Saints will rise up from this and once again be the centre of faith in the community that it has been for the past 153 years! Our thoughts and prayers are with Mark and all of you today. God bless! Roy, Kate, Beth and Martha. All Saints was my Nan’s church, Irene Findley. We had her funeral there & a service of rememberance there too.I also went with her to Midnight Mass on Xmas Eve.I feel very sad that such a Beautiful building that held so many memories for us as a family & countless others has been destroyed.I hope it can be rebuilt. Our hearts go out to you at this sad time. Just wanted you to know that you have the love and prayers of all of us at St Anne’s Church, Bagshot. My parents parish church, am devastated and so is my mum, I remember the celebrations when the church celebrated its anniversary, my mum had taken some lovely photos of the windows and such and sold them as postcards, they will be most treasured. My prayer is that this brings a community together and with God’s will that the church can be rebuilt. So sad to see the damage to a truly beautiful building. Thoughts and prayers are with all the congregation of All Saints and her sister church SS Philip and James. I know you will be grieving over the destruction but remember YOU are the true church and the body of Christ. Stay strong in him and he will bear you up. How sad it’s a lovely church was married there in 1991 as my home town happy memories. This devasting event brought tears to my eyes as it is the church where my darling wife Dorothy and I were married on 8th June 1963. I look forward to donating funds to assist in the re-build in memory of my darling wife who passed away in March 1914. A wonderful church which needs our help. My thoughts and prayers are with the people of Fleet at this sad time. I have sung concerts at All Saints with the Farnham Youth Choir and attended many others. It was such a beautiful building with a very welcoming congregation. I am sure you will re-build. Having moved to Fleet in the late 70’s and attending confirmation classes at this church around 1988 with my best friends before going to the under 16’s night at the Fleet Country Club this church holds many memories…. I am devastated to seethe damage caused by a fellow human. Please let us know where we can donate or volunteer help for the future of All Saints Church Fleet. Circle you O God keep peace within and turmoil without. Circle you O God keep calm within and storms without. Arise today througha mighty strength, the invocation of the trinity.